Or should I say ‘flew with it’? I still love my Watercolour Wings stamp set, which hasn’t seen use in a while. I created the butterfly by stamping the 3 layers in Watermelon Wonder, Pear Pizzazz and Blushing Bride. 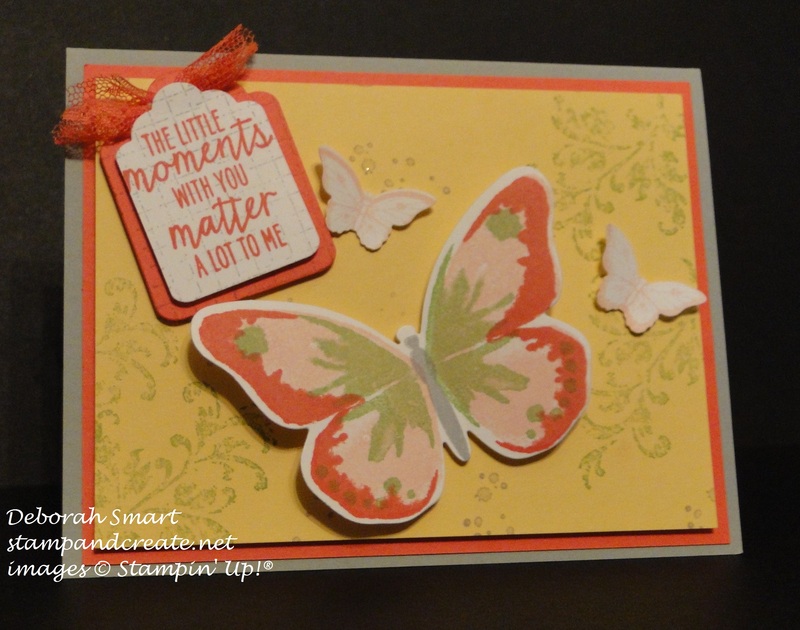 I used the Big Shot and the Bold Butterfly Framelits to die cut it, then stamped the body of the butterfly in Smoky Slate – which is what I chose to use as my ‘neutral’, which are ‘freebies’ in colour challenges. The two smaller butterflies are from another ‘old’ favourite, Papillion Potpourri, stamped in Blushing Bride and punched out using the Bitty Butterfly Punch. Wow – I remember ‘back in the day’, as my son says, having to fussy cut these little butterflies! I do love my punches and dies! To create the background, I took a 3 3/4″ x 5″ panel of So Saffron cardstock, and stamped the flourish and dots from one of my ‘new’ favourites, Timeless Textures, in Pear Pizzazz ink. To create the sentiment, I took a piece of Whisper White cardstock and stamped the hatched texture stamp, also from Timeless Textures, in Smoky Slate, then stamped the sentiment on top of that, in Watermelon Wonder. The sentiment piece and the Watermelon Wonder layer behind it were die cut using the Tags & Labels Framelits Dies. After layering those two together, I then added a piece of the 1″ Dotted Lace Trim in Watermelon Wonder between the top of the two layers. After attaching the butterflies and sentiment to the So Saffron panel, that was popped onto another 4″ x 5 1/4″ panel of Watermelon Wonder cardstock, then attached to the card base of Smoky Slate. On the inside, I added a panel of Whisper White, and stamped the flourishes again in Pear Pizzazz ink on the bottom right and top left corners, but I didn’t add a sentiment; that way, the card can be used for whatever occasion it’s needed. I hope you’ve enjoyed seeing my card, and gotten some inspiration for your own! Please do leave a comment if you have a moment, and then head over to the Watercooler Wednesday page to check out the amazing cards the rest of the Artist team has come up with – you’ll be glad you did! Your card is beautiful, Deborah! You did a great job with the colors. What a great matchup of stamps Deb. I haven’t used my Watercolour Wings or Papillion Potpourri in quite a while now so this is super inspiring. Such a happy, joyful card , thanks for sharing your many talents.